"Step aside Croque Madame, there's a new knife-and-fork sandwich in town!" Mix Greek yogurt and blackberry jam together in a bowl until spread is smooth; refrigerate. Place potatoes in cheesecloth and wring, extracting as much moisture as possible. Combine potatoes, flour, beaten egg, and salt together in a bowl until thoroughly mixed. Divide potato mixture into 4 equal portions and form into 4-inch patties. Heat canola oil in a large skillet over medium-high heat. Cook potato patties in the hot oil until golden brown, about 6 minutes per side. Remove latkes from oil and place on a cooling rack, reserving oil in the skillet. 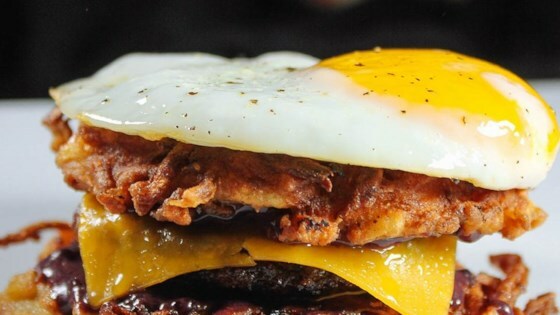 Form breakfast sausage into two 5-ounce patties. Cook patties in the same skillet until browned on the outside and no longer pink in the center, 3 to 5 minutes per side. The internal temperature should be 160 degrees F (73 degrees C). Transfer patties to the cooling rack and top each with Cheddar cheese. Heat a non-stick skillet and add 2 tablespoons reserved heated oil. Crack 2 eggs into heated oil and cook for about 5 minutes. Spread blackberry spread onto 2 of the latkes; top with sausage-Cheddar cheese. Add 1 latke to the Cheddar cheese layer of each, creating a sandwich. Top each sandwich with an egg; season with salt and pepper. If there was a breakfast sandwich Olympics, this sandwich would take the gold. Give your latkes a bit more flavor by adding chopped onion or chives.